Namibia is in the news these days, not only because it will be opening its polling stations on November 28th to renew its Presidency and Legislative Power, but because half of its 2.3 million voters will be Africa’s pioneers in e-voting. Although this election could have marked the beginning of the renovation of the electoral system for a country that carries a long history of electoral malpractice and fraud allegations since its independence in 1990, the truth is that Namibia’s Electoral Commission has decided to do business with India, ignoring the needs of its voters. Last August, the electoral authorities made official the adoption of the e-voting system used in India. To this end, they decided to buy voting machines this nation manufactures. In principle, the step taken by Namibia did not represent any concern, but as the process advanced it was revealed that the devices to be used are rather outdated, equipped with obsolete technology that could jeopardize the electoral event and its results. Besides technical issues, according to leaked information the Electoral Commission also closed a $20-million deal for the acquisition of the machines—that is, several thousand dollars each. This placed the purchase under suspicion, as India has declared to the world that its e-voting devices are very accessible due to their low cost (no more than $400), but it sold them to Namibia as if they were next-generation. India’s automated model is based on the use of a machine or electronic board showing a list of candidates lined up next to a sort of switches at the sides. Voters select their preferred candidates with the buttons and register their vote. The devices are manufactured by two Indian companies, Electronic Corporation of India Limited (ECIL) and Bharat Electronics Limited. The need to update the Indian machines became evident during the April-March elections this year. However, the authorities have not fulfilled their promise of modernizing their system to strengthen some stages of the process, improving the emission of results (audits) and incorporating a vote receipt printed on paper to protect the people’s intent. Namibia will soon begin to use e-voting, but once again, political interests have been placed above the benefit of the citizens. Nevertheless, the presence of international observers could mean that the country might have the possibility of rectifying for subsequent elections, as the recommendations that will be given at the end of the election could sound the alarms about the suspicious purchase. Facing the future, action from the international community, political activists, parties, and the citizens, will be vital not only for the country to fix its mistakes, but to avoid that other African nations follow its steps. Namibia opted for the easy road, even though in the world there are e-voting models that are modern and safe. 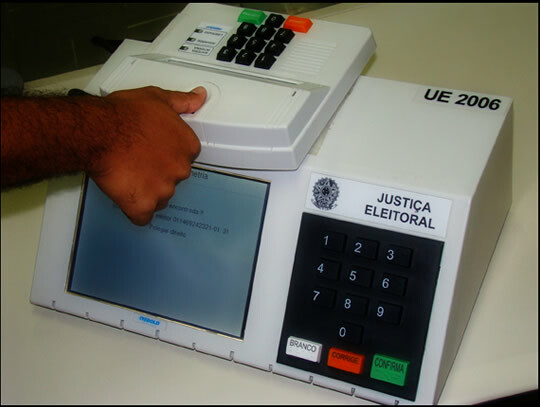 Brazil uses an electronic ballot box featuring a numeric keypad and a biometric identification device. Last October 26th, Brazil and Uruguay carried out different electoral events. Both nations held presidential elections uneventfully. However, upon evaluation of the performance of their electoral systems, substantial differences arise: while Brazilians got fast official results leveraged by e-voting, Uruguayans, stuck to manual suffrage, had to settle with a slow tallying and unofficial results. Describing how the electoral process is closed in Brazil would be enough to illustrate the electoral gap between these two South American countries. As in other regions with e-voting, at the end of the election, tallying and aggregation are carried out automatically, and the transmission of results is done through wired, wireless, or satellite networks, all of which arrives at the results in short times. During the electoral runoff—where Ms. Dilma Rousseff was re-elected—the electronic voting system made it possible to count more than 140 million votes in barely three hours, where 105,476,578 votes were for the presidency and 35,136,837 votes were for 15 state governments. Besides, since the law authorizes to disclose results to the citizens practically in real time, that is, soon after the polling stations are closed and counting starts, the world was able to witness the progress of aggregation at the website of the High Electoral Court. Moreover, the guarantee offered by the automated counting prevented the narrow gap between the candidates (3.2%) from generating doubts or friction. That same day was very different for Uruguay. Although the electoral event concluded peacefully, voters were unable to get official information at the end of the election, as the manual system used did not have the capacity to offer results on Election Day. The electoral dynamics in the country include the fact that polling firms are the ones delivering the first trends, while the Electoral Court offers a primary count the day after the election, which could have errors. It’s only six to seven days later that the official data from the count is released. During this presidential election, the country had to wait until November 1st —six days after voting— in order to get to know the definitive results. This situation will repeat itself next November 30th, at the presidential runoff. Having seen the tremendous difference between Brazil and Uruguay, the reason that speed is one of the most praised benefits of automated elections is the fact that manual voting makes it difficult to yield timely results. This has generated somber episodes, even tragedies, due to the association between the delay in the count and delivery of results with electoral fraud and manipulation. Thus, with e-voting, time in the electoral process becomes relevant, not because of how long the electoral event might take, but because system automation, aside from making voting easier and speedier, ensures that suffrage yields results adjusted to the citizens’ intent, and delivers them timely, guarantees that are impossible to match with manual voting. Colombia’s negative experience with manual voting has been going on for years, mainly because the first results as a rule have been non-official, and the “successful” system used to elect one post—such as the country’s President—has proven totally deficient when elections acquire some degree of complexity—governors, mayors, deputies. Based on the need to advance and leave electoral scandals behind, the country has created the Advisory Commission for the Implementation of E-Voting, a group that pushed forward the resolve of modernizing suffrage once again this year. The task force held a new meeting recently and agreed on requesting the General Solicitor’s support, along with the National Registrar’s IT Management, to “define the most important technical aspects to be required of companies interested in conducting the e-voting test” being prepared by the Nation. Last year, the Registrar’s Office made a summons attended by 16 local and foreign companies specialized in two kinds of technology that Colombia intends to use: PCOS (Precinct-Count Optical Scan), based on the use of a ballot box having an optical scanner for counting ballots, and Direct Recording Electronic (DRE), which consists in the use of touchscreen machines that enable voting, storing votes, tallying them, and transmitting them to a data center. This equipment must also have the capacity to print physical proof of the selections made by voters. 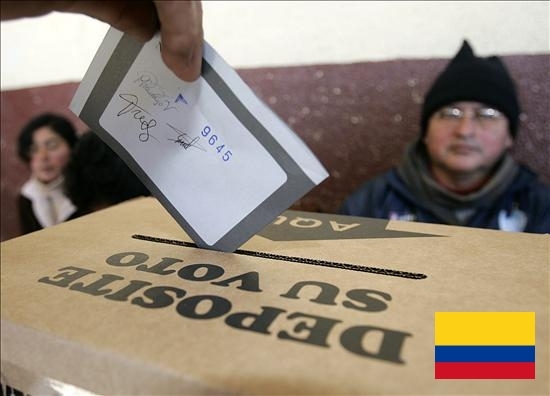 The Advisory Commission informed that the companies seeking to furnish electoral technology for Colombia are: Gerencia Ieconsultores, Smartmatic, Empresa de Telecomunicaciones de Popayán, Dominion Voting, Technology Supplier, Arolén, Sio, Avante International Technology and ID Systems, Scytl, Thomas Greg & Sons Limited (Guernsey), 3M, Colvista, Gestión Informática, Grupo ASD, DPS Data Processing & Systems, Voting Solutions Colombia, and Certicámara. The Advisory Commission agreed to present the proposal for the gradual implementation of e-voting as soon as possible, and also to approve the technical document with the guidelines for the pilot test that will be delivered to the National Government. Colombia is advancing slowly but steadily toward automation. The Commission has been active for over two years, but now it exhibits confidence that for 2015 it will complete the cycle that will enable the country to test out the benefits of electoral technology, so that the nation can effectively leave elections with delayed results and fraud allegations in the past.